The area along the river 木曽川 Kisogawa produced a lot of wood and wooden toys. from the shrine 五宮神社 Itsumiya Jinja. The real horse walks along the village during the shrine festival. It carries 200 "flowers" from bamboo stripes in five colors. 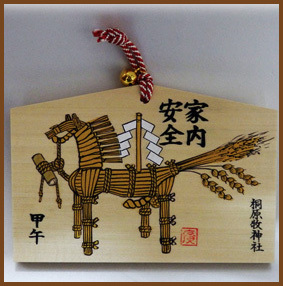 3rd horse carries bamboo flag (indicates ear of rice) on their backs.
. Kiso no hana uma 木曽の花馬 Horse and Blossoms from Kiso . Dating back to the Nara period. for the festival at the shrine 桐原牧神社 Kiriharamaki Jinja, March 8. An amulet to protect from evil influence, have a rich harvest, keep the family happy and have many children. It is made by the local people, with the little male symbol of the horse sticking out for extra joy. 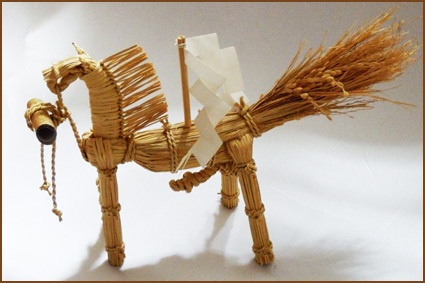 Nowadays they are made by a group to preserve the straw horse. Kirihara used to be a famous and historical pasture area which was owned by the Imperial Court. Many fine horses were offered to the Imperial Court. 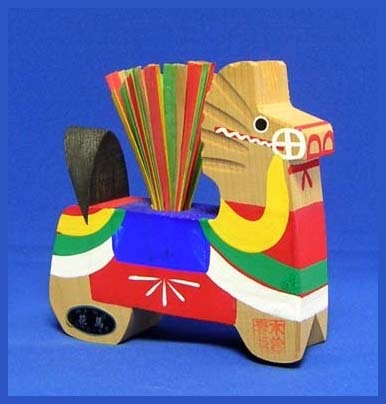 People offer the Warakoma which is the shape of fine horse with some steamed red beans rice and money. This is offered to the Kiriharamaki Shrine in the festival.